The family tree above was reproduced on page 564 of "A History of Northumberland, Volume XII" by Kenneth H. Vickers. An electronic family tree will be added based on one printed in The History of Northumberland with additional information from several family bibles and from the book "The Six Brides of Dilston". It begins with John Grey of Lincolmfield, Longhorsley who married Francis Watson in 1696. His son, also called John of Lincolmfield Parish, Longhorsley, afterwards of Nesbit Chapelry in Doddington Parish, married his cousin’s daughter Margaret Grey of Felton. They had 7 children; one was John of Heton, who bought land in Middle Ord and from whom the Greys who farmed at Galewood and the Greys in New Zealand are descended, another was George of West Ord and Sandyhouse who later lived at Milfield. 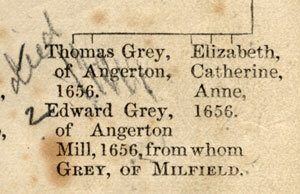 An ancient pedigree in “The Milfield Manuscript or A Genealogical and Historical Account of the Grey Family of Northumberland” by Edmund Hepple has the Milfield Greys descending from Sir Edward Grey, constable at Morpeth castle in 1584, who died in 1631, whose son Thomas displeased his father by his marriage and had the tithe of Learmouth for life only and died before 1658. His son, Edward of Angerton Mill, 1656, is supposed to be the ancestor of Milfield Greys. 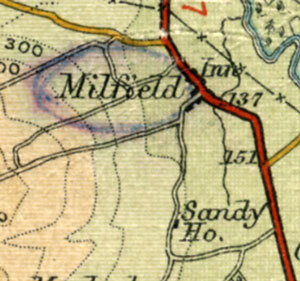 Attempts at verifying the connection between the Milfield Tree above and Hepple's tree have so far proved inconclusive. Edmund Hepple's book also suggests that a French genealogist of great repute has decided that the family came over with the Normans in 1066. Above: The first person at the top of the family tree from the History of Northumberland, Volume XII. (1922) This tree replaced the one in the previous volume and can be assumed to be the state of the Milfield Greys' knowledge of their pedigree at the time. If they or the researchers of the History of Northumberland could verify sources to go farther back perhaps they would have? Right: Edmund Hepple's book published in 1856 has the Milfield Grey's descending from Sir Edward Grey, constable at Morpeth castle, whose son Thomas displeased his father by his marriage and had the tithe of Learmouth for life only and died before 1658. His son, Edward of Angerton Mill, 1656, is supposed to be the ancestor of the Milfield Greys. Above: Neil Grey, (Jock , 1879-1924) has annotated his copy of the Hepple book. He was a keen family historian but has left no information regarding his sources. This tree on page 45 of Hepple begins with Thomas Grey of Heton 1273. Above: The Hepple tree above has Charlemagne 800 at the top of it, and for that reason alone should be treated with a great deal of skepticism. Hepple has added himself to this tree and Jock has crossed any reference to the Hepple family out. One copy of the Hepple book at Milfield used to contain a letter (now sadly lost ) from the author, complaining that he had not been paid. This seems to suggest that the Greys of Milfield commissioned this book, and Hepple's preface says it is based on a document owned by George Annett Grey. 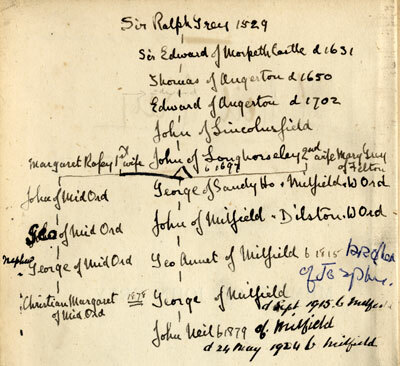 Left: Jock's family tree in his own writing in his copy of "John Grey of Dilston". He has decided that Edward of Angerton is father of John of Lincolnsfield. But we have no evidence for his decision. It is worth noting that the common ancestor of the Milfield and Howick Greys was said to be Sir Ralph Grey of Chillingham which is probably why he was put at the top of Jock's tree. Some modern authors, writing about Josephine Butler, have suggested that she was Charles Earl Grey's first cousin but that is not the case. If these two branches of the Grey family are connected then she may be a first cousin but with a gap of about 8 generations and over 300 years. 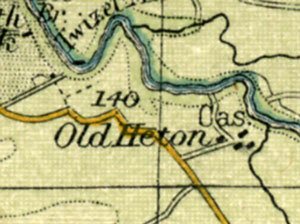 Heaton Castle and Old Heton The family tree on page 45 of Hepple begins with Thomas Grey of Heton 1273. 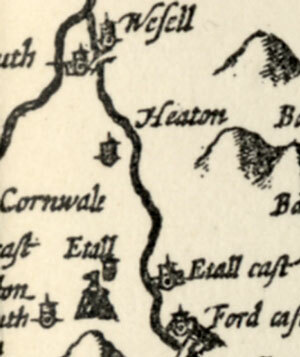 Left: Speed's map of 1610 shows Heaton but unlike Etal and Ford it is not described as a castle having fallen into disrepair by 1541. The surviving remains of it can be seen here. The whole area was up for sale in 2011. The spelling with an "a" appears to have been interchangeable with Heton. Sir Ralph Grey of Chillingham Castle was descended from the Heton Greys. 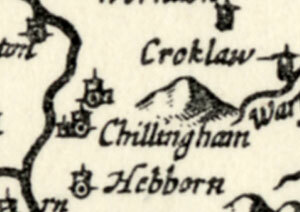 Chillingham can be seen here. Thomas's son Edward lived at Angerton Mill and the Milfield Greys are supposed to be descended from him. John Grey of Longhorsley and of Nesbit in Doddington 1697-1778. 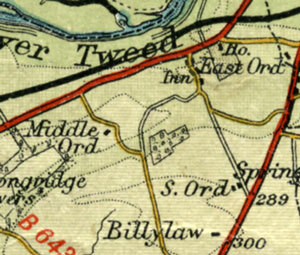 George Grey of West Ord and Sandyhouse 1754-1788 was the first Grey to live at Milfield Hill where five generations followed him. 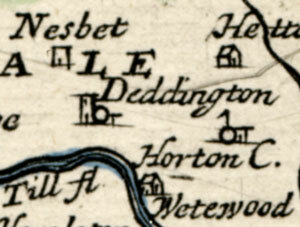 1769 map showing W and E Ord. One of Sir Ralph's descendants was Sir Edward Grey of Morpeth Castle. Left: Tindal House farmed by William Grey and his wife Jane Jobson in the 1870s. 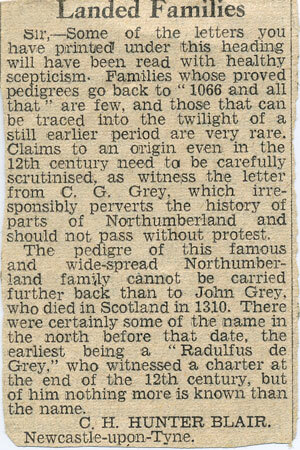 Grey descendants went on to farm or to work at mines in Northumberland. Right: The map lists some of the places where the Greys lived and worked. It continues to be added to and corrected. Click on the link under it to see the key to places. 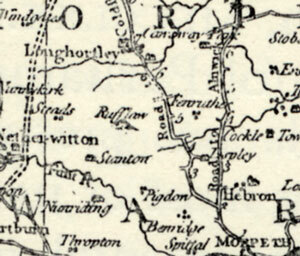 John Grey of Heton, who died in 1817, bought land at Middle Ord, where three generations of Greys were to live. 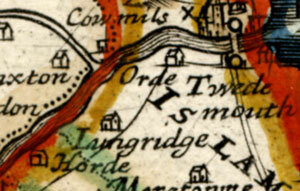 See 1950s map above..
Edward of Angerton's son John was said to be of Lincolmsfield, but this has not been found. 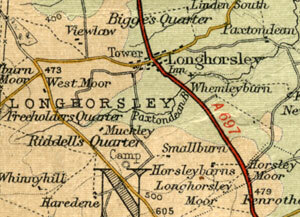 It was in the parish of Longhorsley. 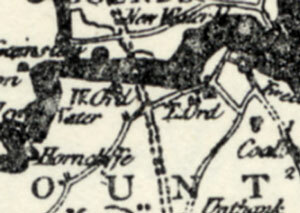 Longhorsley on map left dated 1770. 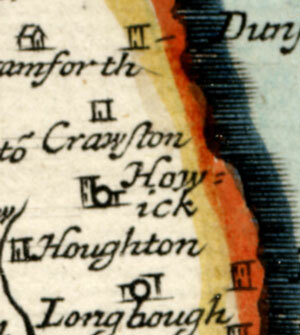 The oldest son of Sir Edward lived at Howick while the youngest Thomas displeased his father and was only given the tithe of Learmouth for life.